Store and apply your chemicals or liquids in one of CleanroomSupply's clear, high density polyethylene spray bottles. We offer two models in two different sizes to suit your application's needs. Our finger sprayer model features a 16oz cylindrical HDPE bottle with a finger spray head capped with a clear top. Our trigger spray model comes with a 22oz bottle body. The trigger-head sprayer is suitable for applying waxes, cleaners, disinfectants, or other fluids and comes with a nitrile ring. 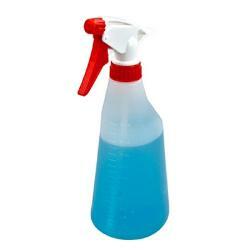 For additional models or volumes of spray bottles, contact CleanroomSupply today!